Odonga Otto (left) wants Evelyn Anite (right) to publicly apologise and also pay him Shs300m in damages. Courtesy photo. 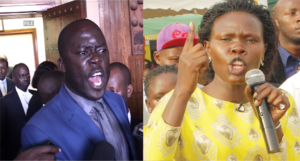 Aruu County MP Odonga Otto has filed a defamation case against State minister for Investment and Privitisation and Koboko Municipality MP Hon Evelyn Anite. The outspoken legislator accuses minister Anite of referring to him as a drunkard and claiming that he has on several occasions begged Anite to connect him to President Museveni. Anite last Thursday accused the fiery legislator of coming to Parliament while drunk. She went ahead to suggest that MPs be suggested to breathalyzer tests before start of business. Through his own law firm of Odonga Otto and Company Advocates, Otto wants Anite to publicly apologize to him and also pay him Shs300 million in damages. Anite in a televised interview also accused Otto of begging for money from President Museveni to support the Age Limit Bill and that when he failed to get it, he became bitter with her. Anite’s claims came after Odonga Otto moved a motion on the floor of Parliament for her to be subjected to the Parliamentary Disciplinary Committee for allegedly endangering the lives of her fellow MPs. The Aruu legislator claims Anite’s remarks injured his image among right thinking members of society, including his constituents back home. “She should pay for the pain, torment and anguish I am undergoing,” MP Otto said. Anite has one week to respond to the demands or else a suit would be formally filed in courts of law.